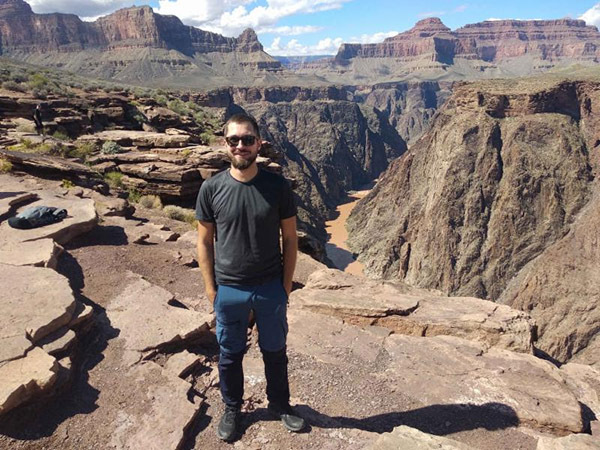 On his way to Eugene this month, ELAW Fellow Milosz Jakubowski visits the Grand Canyon. Poland is home to the world's largest lignite-fired power plant. Lignite is the dirtiest form of coal. Despite devastating impacts on people's health and the climate from burning coal, Poland's state-owned energy company (PGE) seeks to expand current lignite mines and open new ones. "The government says climate change is not caused by burning coal, but community members know otherwise," says Milosz. "Farmers realize something bad is happening, and it is happening now!" ELAW Staff Attorneys and Staff Scientists are working with Milosz to help protect the climate and clean the air in Poland. Many thanks to the Trust for Mutual Understanding for supporting an ELAW Fellowship for Milosz. P.S. If you are in Eugene, join us on Wednesday, October 24, from 6 - 8:30 pm at Temple Beth Israel for: Local and Global Climate Solutions. Milosz will join ELAW Staff Attorney Jennifer Gleason to talk about work in Poland and around the world to protect the climate through law.